The Miskatonic Alumni Project has entered it's third phase. The first was the initial "Wouldn't it be cool...." giddiness. This is the stage filled with enthusiasm for making something new. It's nice while it lasts. The second was the "My God, what have I done?" phase. This is when you take all those cool ideas and start paying for them. It starts off well enough, and then you learn that those handy price lists don't include things like setup fees. Or art fees. Or any kind of realistic shipping fees. What really drives it home is the arched eyebrow of your significant other as you spend the equivalent of, and I believe this is a direct quote, "A week spent lounging in someplace with grass huts and a sandy beach". The third phase is when all that stuff starts arriving. You take a razor knife to the packing tape, rip open the cardboard, and discover that, much to your relief, nothing got futzed up. Even better, it turns out to be just as cool as you thought it was going to be. 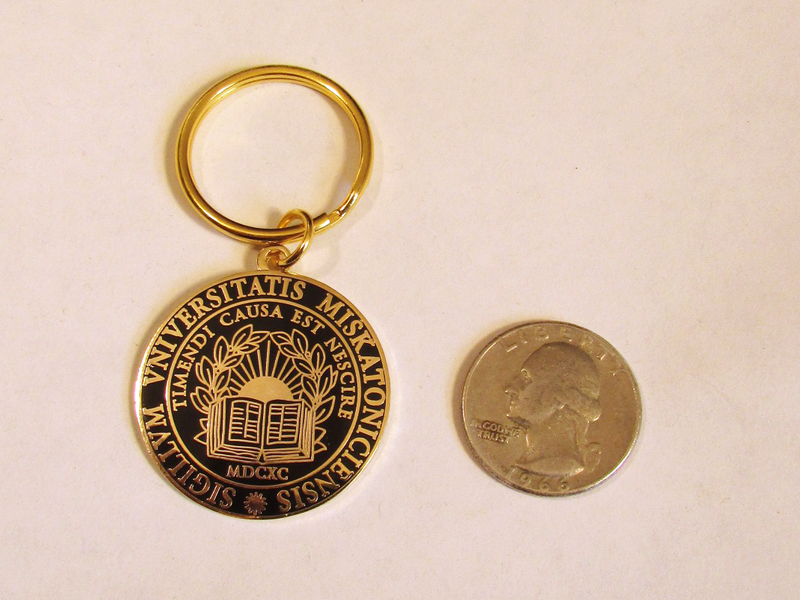 For a brief time you're the only person in the world whose keys dangle from a polished brass and enamel Miskatonic University keychain. Forgive the terrible photography. They weren't kidding about the "polished" part. That dark spot on the bottom of the keychain is the reflection of my camera. On a related note, Geek and Sundry has an article up explaining how Chaosium's hugely successful Kickstarters almost killed the company. There's plenty of blame to go around for the implosion of those efforts, but one of the biggest was the bugaboo of international shipping. The problems began with the Horror on the Orient Express Kickstarter. The previous management only charged international backers $20 to ship a ten pound game. The actual cost of shipping was vastly higher, sometimes as much as $150 for backers in Japan. Meints said that this Kickstarter alone likely lost Chaosium $170,000. When Greg Stafford took over the company, there were still a number of backers who had yet to receive their products. To avoid falling into a similar trap I'm going to give preference to domestic orders for the Alumni package. About a week before they go on sale I'll take orders from anyone who wants multiple sets at a discount. For that initial round I'll take international orders. I expect only a handful of folks will order several, so I'll have enough time to determine actual shipping charges and fill out customs forms for international orders. After that the sets will go one sale to domestic customers with shipping via USPS Priority Flat Rate. For $6.80 it's a steal for a relatively heavy package like this and includes tracking. If there are any sets left once all the domestic orders are taken care of I'll make them available to international customers. To avoid having to worry about this in the future I'm looking in to using Amazon. I'd much rather send one big package filled with goodies to one of their European warehouses and have them take care of shipping, customs, and VAT. That is beautiful. I'm looking forward to these going up for sale. 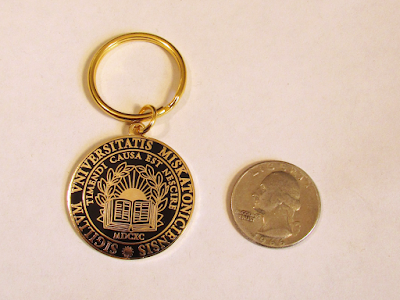 Glad the keychains came out OK.